This entry was posted in Chapter 15 by Christopher Gronlund. Bookmark the permalink. OMG!! I certainly remember Stuckey’s. How we looked forward to stopping there. We would have either breakfast or lunch depending on how far it was from our motel. I always got a praline AND a pecan roll, plus we got to get sodas to bring with us. (Our trips were about the only time we kids were allowed sodas) We would also stock up on comic books and puzzles fort the next leg of the trip. Wow. What a ‘blast from the past’. I enjoyed this episode too. Thanks. 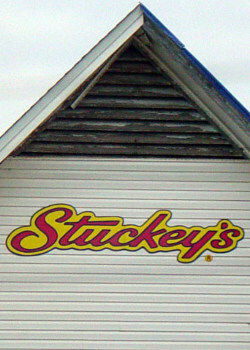 I used to get soooooooooooooo excited at the site of a Stuckey’s on road trips. I can’t remember if it was my sister or step brother, but one of them always got pralines, too. I was all about the pecan roll. I used to love stopping off an buying comic books, too. At home, I read super hero comic books, but on the road, I read a lot of Disney comics (and other comics based on cartoons). I loved the way comics used to be packaged in three-packs on the road. I’m glad you enjoyed this episode and the mention of Stuckey’s. I got your e-mail and replied; I hope you enjoy the CD when it arrives. Not only is Pirato Ketchup a great band, they’re a nice bunch of guys.